advanced online print store. Present yourself or your business in the best possible way for less. provides you with thousands of pre-loaded templates and customizable products. Letterheads, Greeting Cards, Postcards, Flyers, Posters, Brochures and much more. quantities or simply a complete custom project that is not listed on our website, please give us a call! Your Printing Matters, so we will ensure that your image is consistant on every project we produce from our wide range of printing and bindery services. stationary packages • booklets • cataloges • note pads • calendars • presentation folders and more! eye, then you probably need a graphic designer to add a professional touch to your business. 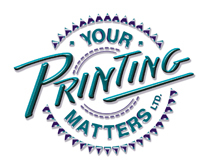 Your Printing Matters can help you add a design edge to your business communications. helping you stand out from the competition. logo design • corporate identity • direct mailers • promotional material • newsletters etc. and more! Our attention to detail continues right through to the delivery of your printed material. Some of our mailing services include: Data Processing, Personalization and Lettershop services.